mPrint allows you to print from any program (through the normal print menu) directly to any printer on any campus. It works on Mac or Windows computers or laptops by using a a campus-specific print driver that you download and install onto your machine. You can install the print drivers for more than one campus. If you already have mPrint installed, please follow the instructions under How to Uninstall mPrint below to remove the previous version first. Before installing a new version of mPrint, you should use these instructions to uninstall the old version to help ensure a clean install. 5. 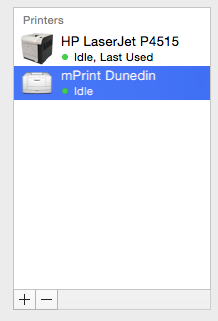 Restart your computer, then install a new version of mPrint if desired.